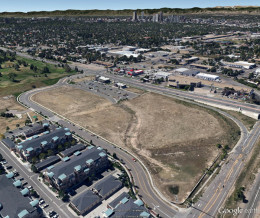 Urban Land Conservancy purchased ArtWay North (formerly known as Park Hill Village West) in March 2013. 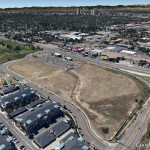 Denver’s Transit Oriented Development (TOD) Fund and program related investments from the Piton Foundation and Gary Community Investments financed the acquisition. In 2014, ULC partnered with DelWest for the first phase of development, to construct 156 units of affordable housing. Park Hill Station Apartments opened in April 2016. Located adjacent to the 40th and Colorado Station, Park Hill Station residents are just a short walk from RTD’s A Line Commuter Rail. In due time, the multi- phase development stages will eventually produce over 400 units of housing and 80,000 square feet of commercial space. Wells Fargo played a major role in the development of the Park Hill Station Apartments, and recently posted a video detailing the importance of transit oriented development. Park Hill Station Apartments, phase one of ULC’s Park Hill Village West Development, celebrates it’s grand opening. The 156 units of affordable housing were developed by DelWest. Park Hill Station Apartments will move new families in starting in February 2016. Park Hill Station Apartments Construction is over 50% Complete!